Signal whips are a type of single-tailed whip, originally designed to control dog teams. A signal whip usually measures 3 to 4 feet (0.91 to 1.2 m) in length. 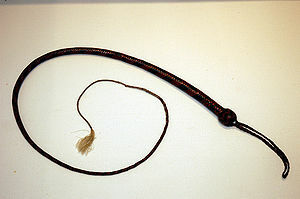 Signal whips and snake whips are similar. What distinguishes a signal whip from a snake whip is the absence of a "fall". A fall is a piece of leather attached to the end of the body of the whip. In a snake whip, the "cracker" attaches to the fall. In a signal whip, the cracker attaches directly to the body of the whip. This page uses content from Wikipedia. The original article was at Whip. The list of authors can be seen in the page history. As with Spanking Art, the text of Wikipedia is available under a copyleft license, the Creative Commons Attribution Sharealike license.